Here's a story that has been on a few internet sites that I think many of us oldies can relate to. As far as I know the author is unknown. If the author happens to read this, let me know and I'll see that you get due credit. A stranger came by the other day with an offer that set me to thinking. He wanted to buy the old barn that sits out by the highway. I told him right off he was crazy. He was a city type, you could tell by his clothes, his car, his hands, and the way he talked. He said he was driving by and saw that beautiful barn sitting out in the tall grass and wanted to know if it was for sale. I told him he had a funny idea of beauty. This article may seem like a departure from the norm but you will quickly see that it is very appropriate since we have gone nation wide with our camps. We are at risk of our media devices being hacked by unscrupulous miscreants. We, at Retreat & Refresh Stroke Camp, are traveling cross-country frequently going to camps and working with hospitals and sponsors in other states plus the MegaBrain exhibits we organize and attend throughout the country. As we go, we sometimes must stay in motels and use our laptops, tablets and cell phones for business as well as personal communication. However, what I'm addressing is appropriate for anyone who travels and stays in hotels and motels and other public places, including restaurants and airports. I will refer to laptops, tablets and cell phones as media devices in this article. I have taken some of this information from a newspaper article called Cyber Speak, hosted by Kim Komando, www.komando.com. This is an extremely useful web site for computer, tablet and cell phone usage with tons of useful information, utilities, apps and programs for these devices. When we stay overnight in motels during our travels to camp, we like to use our media devices for many reasons. We use them to plot the next days route, keep track of weather, pass time with games, read novels, and keep in touch with family and friends. This includes searching web sites, sending emails and using FaceBook or Linkedin. Even Nooks and Kindles are vulnerable if used to access the internet. The biggest danger of using our media devices on public Wi-Fi is hackers on the same network. I'm talking about motel/hotel Wi-Fi specifically but this also applies to restaurants and coffee houses and any place where you use a public Wi-Fi network. Hackers can be in their motel rooms, the motel lobby, the motel bar, and even in the motel parking lot. Sometimes they can even connect from another nearby building if it is within range of the Wi-Fi router you are using. I should also add here that you are even vulnerable at home if you don't password protect your personal Wi-Fi router. Hackers can capture every single thing you do on the internet. There many internet vulnerabilities even in your own home not just public Wi-Fi ones that we must be careful about but in this article I'm addressing only internet usage over a public Wi-Fi router. Also, this does not pertain to cell phone usage over cell phone towers. There are other issues calling on cell phones but I'm not knowledgeable enough about that to address those issues. From what I understand you're pretty safe using cell phone calls to do really sensitive tasks like banking as long as you're not using their internet feature. Today's cell phones can use the internet through 3G or 4G connections. Hackers are getting more and more proficient at hacking media devices. Yes, even cell phones that use a public Wi-Fi connection. They can easily read your passwords, emails, and more as you send and receive information over the internet. Some hackers even set up fake Wi-Fi hotspots with names like "Hotel Wi-Fi" or some name permutation of the place where you are staying. If you connect to it, hackers not only see all your traffic, they can send you to malicious websites that steal your information right off your device. MAKE SURE YOU KNOW THE REAL NAME OF THE ESTABLISHMENT'S Wi-Fi ROUTER BEFORE YOU SIGN ON! As I said, use cellular for any really sensitive tasks like banking. And, for tablets and cell phones, be sure to use your bank's app as well, because that will be more secure. For laptops, type in the bank's web address yourself. Do not click on any link you didn't create yourself or type in your user ID and password on any popup window you didn't initiate yourself. Make sure you absolutely trust any emails you get that contain links you are asked to click on, especially if they don't tell you anything about the link or use strange verbiage. Do not trust just the sender's name. I have received emails where the sender name was the name of someone I knew but when I looked at the actual email address it was not theirs. This has happened to me more than once and you should learn how to recognize this ruse. All browsers give you a way to display the actual sender email address. If you don't see it, delete the email immediately. If you get a popup window you didn't ask for, close it out by clicking the small x at the top right of the box. Don't click any buttons in that popup window no matter how they are labeled. Only click the little x at the top right of the popup window. And sometimes that's not even good enough. You are probably better off not doing anything and re-booting your computer. If it pops up again either ignore it or shut down until you can get professional help. Kim also suggests using an encryption app like Avast! SecureLine VPN or HotSpot Shield VPN to encrypt your traffic. This makes it almost impossible for anyone to snoop what you are sending. These are free apps and can be found on her site. I hope I didn't frighten you, but instead made you more cautious. Many times it's hard for me to understand the motives behind hacker attempts. Mostly it's financial gain they're looking for but a lot of it is just plain malicious. I wouldn't be surprised if this particular article draws more spam than most. to contract in an organized way. This leads to decreased pumping action and passive blood flow. Blood can even pool within the heart. Some people with afib have no symptoms, while others experience a wide range of symptoms. Afib increases the risk of heart-related disorders and stroke. Atrial fibrillation (also known as afib, or AF) is an electrical disorder of the upper chambers of the heart. It increases risk of heart-related problems and stroke. More than two million Americans have afib, according to the Cleveland Clinic. Afib affects the upper chambers of the heart, called the atria. It’s an electrical disorder that causes rapid electrical signals in the heart that may reach hundreds of beats per minute. The rapid-fire signals interfere with the ability of the upper chambers to contract in an organized way. The lungs require a steady supply of blood in order to function properly. Irregular pumping action of the heart can also cause fluid to back up in the lungs. Symptoms include shortness of breath, difficulty performing physical activities, and fatigue. If you want to use music to help you or someone else relax, you need to think of music as a tool you can use purposefully to achieve a certain effect, not as entertainment and not as background noise, but as a tool. And the first step in this process is to identify the music that you find enjoyable and aesthetically pleasing. We all instinctively know what music we feel is relaxing to us. Some people find New Age piano relaxing, while others classical violin music, yet others love Gregorian chant. And what is relaxing to one person might be terribly grating to another. The key is to find what works for you. Another secret is not in what kind of music you use, but how you use it. Imagine that you are at the end of a stressful day at work or are “keyed up” after playing with grandchildren at the end of the day. You would like to be quieting yourself down and getting ready for bed so you put on some soft violin music with ocean waves in the background. This may relax you, or it might actually make you more agitated even if it is music you normally find relaxing. This is because the music you chose does not match how you are feeling in the moment. What you need to pick first is music that more closely matches how you are feeling. Then you would follow that song with songs that are GRADUALLY slower. Five or six songs should do the trick. That way you encourage your body and your brain to slow down or entrain with the music. This technique is called the iso-principle and is very effective at relaxing yourself or others. Incidentally, you could achieve the opposite effect (wake somebody up who is very sleepy) by doing it the other way around. You would start with a slow song followed by songs that are gradually faster. Gradually is the key word here because the music can then work at a subconscious level to achieve whatever it is you want to achieve. So by identifying music that is right for you, putting 5-6 songs in a sequence of fastest to slowest, and using it as a tool you may find yourself feeling more relaxed in no time. Dr. David Z. Wang, DO is our "go to" doctor for stroke related help and information. Dr. Wang is a Board Certified Vascular Neurologist with the Illinois Neurological Institute (INI). He is the Director of the INI Stroke Center & Network. He has led the INI Stroke Center to become the first JCAHO certified primary stroke center in the State of Illinois. Dr. Wang is also clinical associate professor of neurology and vice chairman of the department of neurology at the University of Illinois College of Medicine at Peoria. He practices at Pekin Hospital in Pekin, Illinois and OSF St. Francis hospital in Peoria, Illinois. Here is an email Dr. Wang sent to the Stroke Team about the 5th Grade Education that has gone "International" since Dr. Dong took it back to China with her after her six months here in a Fellowship with INI. Dear All,You should be very proud of what you have done in expanding your mission. Please see the attachment. Dr. Dong, who was here for 6 months, and went along with Jan (Jahnel) and TSD to do fifth grade education has done one school children education in Shanghai. This was the first! 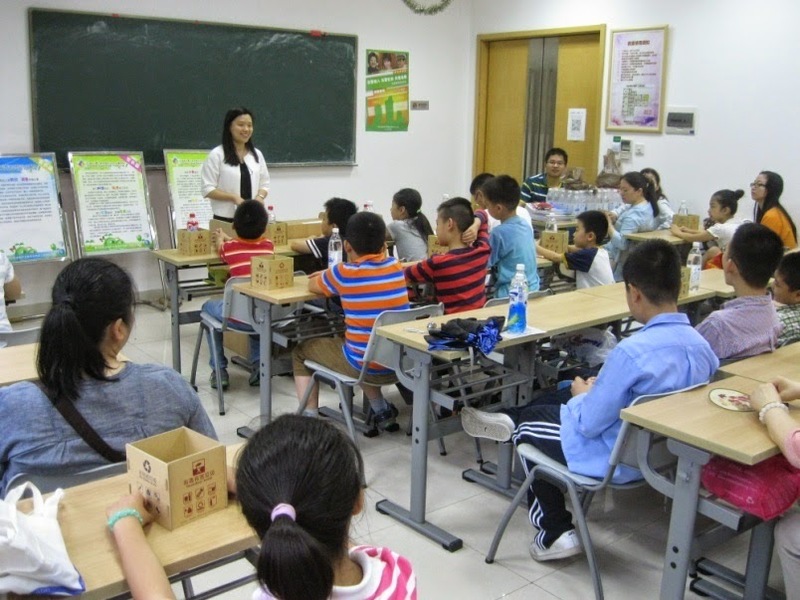 Huashan hospital has collaborated with the Jinan neighborhood many times to provide medical education to the public. This time Dr. Dong gave a talk on “Getting to know about stroke”. People may be puzzled as to why teaching kids about stroke and would kids have trouble comprehend? At the beginning of the talk, Dr. Dong answered this question. She said to the kids and their parents that stroke education to the fifth graders have been done often in the US. Since children are often having their adult parents or grandparents accompanied, once stroke happened to these adults, children can act upon quickly and save their lives. She also said that it is not difficult to understand stroke. After she talked about stroke in an easy to understand way, children understood her well. They especially paid attention to those stroke cases she illustrated. Children afterward realized that this lecture not only taught them about stroke, but also called upon their responsibility. In order to let children have a feel how being handicapped would feel, she designed an experiment. She divided up those kids into four groups and asked them to either use one hand to write, fold a towel, put shoes on or get backpack ready. Kids realized that it is painful to complete these taking for granted daily routine if being handicapped by stroke. They had a better understanding whey there is an urgent need to save the brain from stroke. Lastly, Dr. Dong said to them that stroke is preventable. She taught them that everyone should have a healthy lifestyle starting when they are young: exercise routinely, watch out for your diet, do not smoke, etc. She asked children to keep an eye on their parents on observing these healthy life styles. Children loved her lecture and felt this time the theme is not only refreshing but offered useful information. They were really very involved. The neighborhoods and schools have decided to conduct more stroke education activities by the hospital so that more people can have a healthy life.